Demonstrations against police violence escalated for a second day Thursday, as thousands took to the streets, outraged that the state will not bring any charges against Daniel Pantaleo, the New York City police officer who was videotaped violently choking Staten Islander Eric Garner to death. The largest demonstrations were held in New York City, where an angry and diverse crowd of thousands filled public squares, marched through streets and crossed bridges. Police arrested dozens, as demonstrations continued late into the evening. More than 200 protesters were arrested on Thursday night, following more than 80 arrests the night before. In Times Square on Thursday, police used ambulances to stop the flow of demonstrations, disperse and “kettle” protesters, then carry out mass arrests. Protesters also marched in Chicago, Boston, Baltimore, Washington D.C., St. Louis, Dallas and other major cities and at college campuses. Chants of “I can’t breathe” (Eric Garner’s last words) and “Hands up, don’t shoot” (referencing the police killing of Mike Brown in Ferguson, Missouri) echoed throughout the night. Despite New York City Mayor Bill de Blasio’s efforts to differentiate the response of the NYPD to that of Ferguson police—he pledged to grant the protesters “space” to demonstrate—the police presence was overwhelming and their tactics at times highly provocative. The NYPD, which last week sent detectives to Ferguson, mobilized hundreds if not thousands of police officers for the demonstrations. They came prepared with armored vehicles, LRAD sound weapons, tactical SWAT vans and paddy wagons for mass arrests. Hilary, a native of Brooklyn, said: “The failure to indict was quite wrong. It shows that cops can do anything they want and get away with it. This should be looked into seriously. One thing I want to say is that, white or black, this is an injustice. There are white kids being killed by police. There was a [white] 17-year-old in Georgia who was killed by a cop. “This has to stop. They are trying to make the police in this country into a military force. You’re giving them machine guns and all kinds of ammunition. I am very surprised that you need a permit to go out and protest. Every few years our rights as citizens of the country diminish. It makes me quite mad, and I want America to wake up. The police forces are going to take over. They have to protect the moneymakers of this system, this capitalism that we live in. Michelle, a recent graduate of Williams College participating in demonstrations in New York, told the WSWS, “I came out tonight because I care about my brothers and their ability to walk around unharmed. The failure to indict was heartbreaking, but also very telling of the kind of justice system that we are working with. Meanwhile, the operation by the Democratic Party to contain popular outrage pressed forward Thursday. Mayor de Blasio appeared with New York City Police Commissioner Bill Bratton at a press conference, proclaiming that, “the way we go about policing has to change.” Rhetoric notwithstanding, de Blasio offered next to nothing in terms of concrete actions: a three day mandatory “retraining” course for all officers on top of a pilot program announced yesterday to outfit 90 patrolmen with video cameras. Officials in New York are coordinating the response closely with the Obama administration, which announced shortly after the grand jury decision that the Justice Department will proceed with a Federal civil rights investigation. A similar investigation into the police killing of Michael Brown in Ferguson is not expected to result in any charges, according to officials interviewed by the Washington Post. Earlier this week, the Obama administration gave its full backing to the continue militarization of police forces throughout the country. It was the end of the road for Chuck Hagel last week and the Washington press corps couldn’t have been more enthusiastic about writing his obituary. In terms of pure coverage, it may not have been Ferguson or the seven-foot deluge of snow that hit Buffalo, New York, but the avalanche of news reports was nothing to be sniffed at. There had been a changing of the guard in wartime Washington. [Note for TomDispatch Readers: My thanks to those of you who recently contributed $100 (or more) to this website in return for a signed, personalized copy of the new hardcover edition (with two extra essays added!) of Rebecca Solnit’s indie bestseller, Men Explain Things to Me. The offer will remain open for just a few more days, so if you meant to get a copy, hustle to our donation page ASAP. Available there as well, is my new book, Shadow Government: Surveillance, Secret Wars, and a Global Security State in a Single-Superpower World. My gratitude to TD readers who are still sending in donations for it. A little end-of-the-year infusion of cash is, believe me, a big help for this site. Meanwhile, in a reversal of a long-stated position -- that the American combat role in Afghanistan was to end this year -- the president recently issued a secret directive green-lighting just such a role, both on the ground and in the air, for 2015. Soon after, the new Afghan president, clearly under American pressure, lifted a ban on controversial U.S.-supported “night raids” in his country, and reports began filtering out that the trajectory of withdrawal was about to end and extra U.S. troops would be added to the Afghan mix in 2015. 2. Election 2016 as an Intra-War Party Affair: In the wake of the invasion of Iraq, Bush v. Kerry in 2004 was, of course, a war election; 2008, however, proved a curious rarity, an election about war in which Americans generally thought they had voted for an anti-war candidate (as, of course, did the Nobel Prize Committee, which -- to use an ill-chosen phrase -- jumped the gun in 2009 by awarding its peace prize to Barack Obama just as he was about to officially “surge” in Afghanistan). The 2012 election was a status quo one in which, thanks to the bin Laden raid, the president had inoculated himself from Republican charges of wimpism even as he had seemingly fulfilled his previous campaign promise to end the war in Iraq. Over the past 30 years, wealth has grown exponentially and has become increasingly concentrated foremost in the upper .01%, then the .1%, followed by the 1% and the upper 10% - 20%. Indonesia, - percentage-wise is the leader in the outflow of illicit flows – fully 23% of annual output. 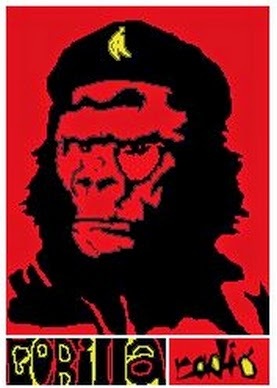 The 1% elite of foreign and domestic capitalists, plunders natural resources, timber, metals, agriculture and dis-accumulates. Profits flow to foreign accounts in Tokyo, Hong Kong, Singapore, Sydney, Los Angeles, London and Amsterdam. While illicit financial flows have financed some productive activities, the bulk has vastly expanded the financial sector. The absorption of illicit flows by the financial elite has led to greater inequalities of wealth between the 1% - 10% and the rest of the labor force. Factories still produce, agro-business still exports, the paper value of high tech companies has risen into the high billions, but the ruling 1% of the system stands or falls with the illicit financial flows drawn from the pillage of treasuries. To replenish pillaged treasuries, regimes insist on perpetual ‘austerity’ for the 90%: greater pillage for the 1%, less public revenues for health care which results in more epidemics. Less funds for pensions means later retirement-- work til you die. The plunder of the economy is accompanied by unending wars – because war contracts are a major source of illicit financial flows. Plunder oligarchs share with militarists a deep and abiding belief in pillage of countries and destruction of productive resources. The one reinforces the other in an eternal embrace – defied only by insurgents who embrace a moral economy and who proclaim the need for a total change – a new civilization. 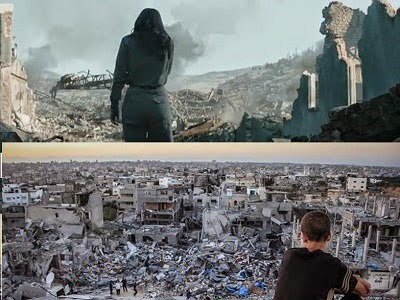 The Mockingjay of Palestine: "If we burn, you burn with Us." Raed Mu’anis was my best friend. The small scar on top of his left eyebrow was my doing at the age of five. I urged him to quit hanging on a rope where my mother was drying our laundry. He wouldn’t listen, so I threw a rock at him. I didn’t mean for the rock hit him, but it did. Up: District 12 (Hunger Games). My father dragged to me to his house kicking and screaming, while carrying a colourful rubber ball and a doll for gifts. I was mostly embarrassed that I hurt my best friend. - Ramzy Baroud is an internationally-syndicated columnist, a media consultant, an author and the founder of PalestineChronicle.com. His latest book is My Father Was a Freedom Fighter: Gaza’s Untold Story (Pluto Press, London). Washington DC – A momentous event took place in the U.S. Capital city last weekend (Nov. 8) which, I can confidently describe as, nothing other than ground-breaking. 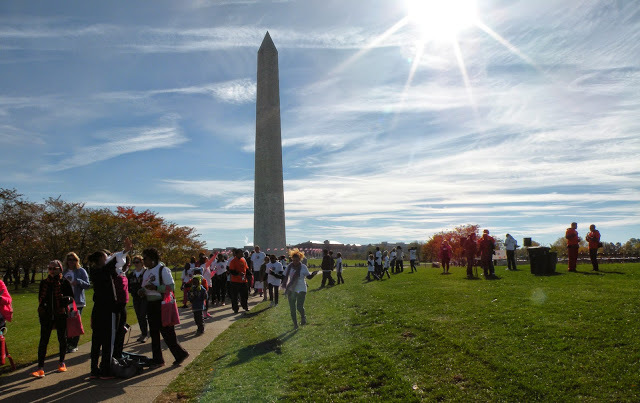 A first of its kind in the Washington DC area was this remarkable ‘Walk against Female Genital Mutilation’ at the Washington Monument, hosted by the Global Woman P.E.A.CE Foundation. Full credit and accolade is due to GW-PF for the Walk’s bounding success. 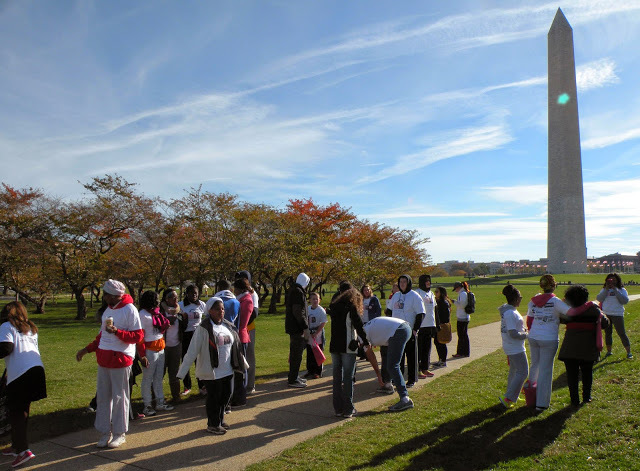 Its courageous aim was specifically designed to have Walkers circle the paths around the Washington Monument in the effort to raise profile, of the growing problem of FGM on Western soil. The evidence of Female Genital Mutilation, as the imported but ‘unseen’ underground practice occurring as a result of international migration, continues to mount. Global Woman P.E.A.C.E Foundation is a well-vetted woman’s rights and peace organization with registered U.S. charity status and is based in Fairfax, Virginia. With its strong organizational reputation and with its links to the worldwide movement against FGM, the Walk was successful in being able to attract a diverse group of participants from all over U.S. (including Canada) agreeing to participate as Sponsored Walkers. 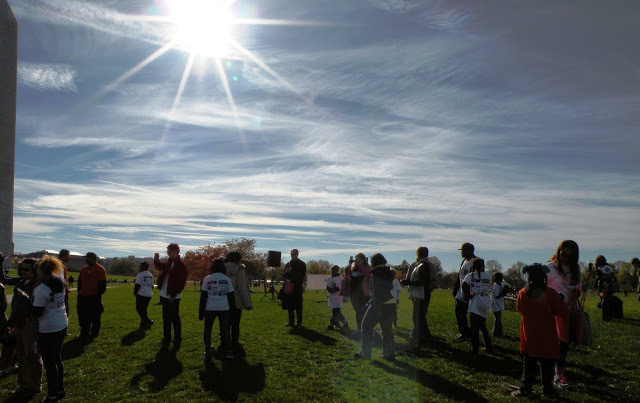 Walkers raised their own sponsorship and joined in the cause on the freezing cold but sunny Saturday morning of November 8 2014 and, as one of the proud, I can say it was an incredible experience and a worthy measure to create globalized action with American leadership. I met up with the tightly knit group of international anti-FGM activists who gathered together at the NW corner of the Point to raise needed awareness with a specific emphasis on the US situation. The event urged that immediate action be taken on U.S. soil to ensure complete prevention of FGM; the commitment of it never being able to take place in the U.S. Furthermore the Walk emphasized the need to secure the goal of a U.S. commitment to complete eradication worldwide; in concert with the 2010 UN resolution against FGM and associated solidarity activists. The Walk itself on the day of, may have been missed by, a seemingly sleepy, Washington Post, seen omitting to provide coverage of the event despite its global importance – but that’s not to say they can’t make up for it! Nevertheless the Walk was indeed picked up repeatedly by the international press and news spread on social media with exuberance. Here in this video http://www.youtube.com/watch?v=fIJBdzv2ISU, is one the speakers invited as a key note, Barbara Mhangami. She is a feminist poet and researcher who travelled from Michigan. She, among others, is an example of the shinning talent and commitment of the some of the ‘Activist Walkers’ who sought to promote GW-PF’s aim to open a Crisis Centre right in DC. Guaranteed preventive action against FGM for girls living in the U.S. in addition to service provision for post-FGM women, is, key. More pictures of speakers and attendees here. Global Woman P.E.A.C.E Foundation is committed to real action on the ground and has now raised leading awareness in the Capital. The Walk succeeded in pushing strongly against Female Genital Mutilation, focusing on exposing incidents of the practice on U.S. soil and, importantly, recognizing working in collaboration and in solidarity with a global alliance of activists against FGM to build identification and response services (#IDRS on twitter) to address the problem. FGM has spread to Western soil, this is undisputed in Europe. It has also leaked out recently that FGM has occurred in the U.S. – this must not be allowed to go unnoticed and unrecorded. Information is that family groups have joined with other family groups to raise money to ‘import the cutter’ to perform FGM in secret. No one can dispute that this is heinous and frankly ghastly that it happens in the West. The Walk’s acute profile is being recognized worldwide and is galvanizing efforts to put this issue at the top of the U.S. political agenda. GLOBAL WOMAN P.E.A.C.E. FOUNDATION “WALK TO END FGM” A GREAT SUCCESS! November 12, 2014: Fairfax, VA. – Global Woman P.E.A.C.E. 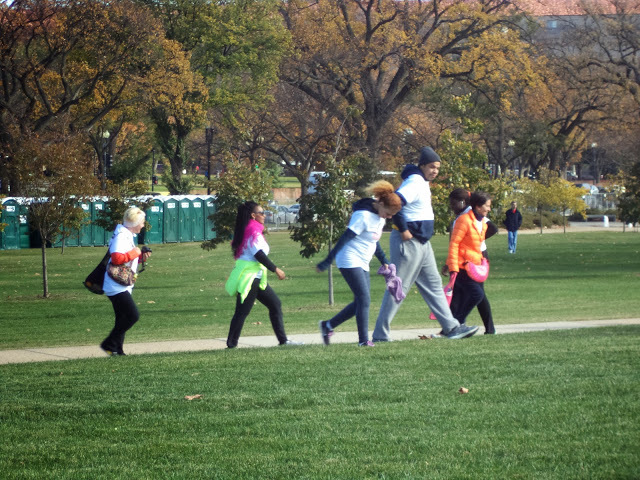 Foundation (GWPF) was joined by its partners and supporters on Saturday, November 8th on the Washington National Mall to “Walk to End FGM”. The day began with music, as the crowd gathered to get outfitted in warm clothing and t-shirts. Families and their children assembled in the chilly early morning sun but the atmosphere was positive. Everyone was there to be a part of a memorable occasion; they were there to participate in the first annual walk to end female genital mutilation (FGM). No other organization has ever held a walkathon against the practice of female genital mutilation in Washington, D.C.
As the temperature began to rise, 14 teams of walkers lined up after bananas, granola bars, peanuts and water had been distributed to the crowd by many volunteers. The teams of walkers made their way up Constitution Avenue toward the memorials of World War II, Vietnam Veterans, Lincoln, Korean War, Martin Luther King and the Washington Monument. The crowd returned with enthusiasm to the National Mall to listen to a series of speakers tell them about female genital mutilation. Participants came from as far as Canada, Massachusetts, Florida, Arizona, Indiana, Michigan, Pennsylvania, New York, Richmond, Virginia, Hagerstown, Maryland, etc. Entertainment was provided by local groups, the Liturgical Dance Group and the Chosen Generation Dance Group. Media coverage was provided by PressThePresident, BRITE Radio, Loudon Woman Magazine, Diane Walsh and Alexandra Gerard. In conclusion, Peabody announced the 3 winning teams. The Women’s Institute for Freedom of the Press team took the first prize for raising the most money, the FGM No More team walked away with the 2nd prize, while the BRITE Peace Walkers team took 3rd prize. 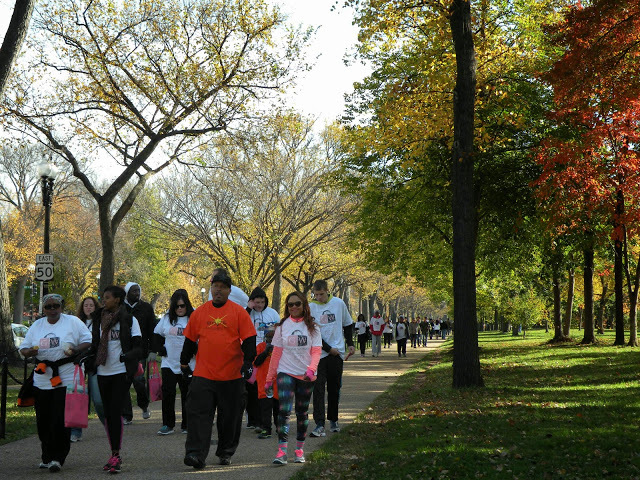 The proceeds raised from “Walk to End FGM” will help establish a special support center in the Washington, D.C. metro area, expected to open in 2015. The support center is expected to include a hotline with trained phone counselors, career assistance and capacity building for the girls and women affected by FGM. To learn more about Global Woman P.E.A.C.E. Foundation and future events or to make a donation, visit http://www.globalwomanpeacefoundation.org. Global Woman P.E.A.C.E. Foundation is a registered 501c3 non-profit organization with the U.S. Internal Revenue Service. As such, your donations are tax deductible to the maximum extent required by law. Josh Paterson, Executive Director of the BC Civil Liberties Association, reacted this afternoon to the decision of the BC Supreme Court to throw out contempt charges against dozens of protesters on Burnaby Mountain because it was unclear whether they had violated the court's order. "The RCMP made an unacceptable mess of this injunction, improperly arresting nearly 100 people. Today the court has cleaned up the mess. The RCMP arrested demonstrators for violating the court's order when those people hadn't crossed the line. Some of these people were deprived of their liberty over an entire weekend. The court made clear that the police had no authority do to that. This is a victory for the constitutional right of people to demonstrate and to express themselves." Yesterday, the BCCLA stated that it was concerned that many of the arrests may have been illegitimate because the RCMP had been arresting people for entering an "exclusion zone" that extended beyond the boundaries of the court's original injunction. The court's ruling confirms that it was inappropriate to re-interpret the injunction as applying to that larger zone, and to charge people with contempt for entering the zone. "We have argued publicly that there was no compelling legal justification to further infringe people's constitutional rights on Burnaby Mountain and the court has agreed." The BCCLA did not have a lawyer arguing at the hearing. In a blatant and massive market intervention, the price of gold was smashed on Friday. Right after the Comex opened on Friday morning 7,008 paper gold contracts representing 20 tonnes of gold were dumped in the New York Comex futures market at 8:50 a.m. EST. At 12:35 a.m. EST 10,324 contracts representing 30 tonnes of gold were dropped on the Comex futures market. No relevant news or events occurred that would have triggered this sudden sell-off in gold. Furthermore, none of the other markets experienced any unusual movement (stocks, bonds, currencies). A rational person who wants to short gold because he believes the price will fall wants to obtain the highest price for the contracts he sells in order to maximize his profits when he settles the contracts. If his sale of contracts drives down the price of gold, he reduces the spread between the amount he receives for his contracts and the price at settlement, thus minimizing his profits, or if the price goes against him maximizing his losses. As you can see from the price-action on the graph, massive sales concentrated within a few minutes minimize sales proceeds and are at odds with profit maximization. A rational seller would not behave in this way. What we are witnessing in the bullion futures market are short sales designed to drive down the price of bullion. Manipulation is intentional conduct designed to deceive investors by controlling or artificially affecting the market for a security…[this includes] rigging quotes, prices or trades to create a false or deceptive picture of the demand for a security. Those who engage in manipulation are subject to various civil and criminal sanctions. Why is manipulation of the price of gold in the futures market not investigated and prosecuted? The manipulation has been blatant and repetitious since 2011. The answer to the question is that suppressing the price of gold helps to protect the U.S. dollar’s value from the excessive debt and money creation of the past six years. The attacks on gold also enable the bullion banks to purchase large blocks of shares in the GLD gold trust that can be redeemed in gold with which to supply Asian purchasers. Whether or not the Federal Reserve and the U.S. Treasury are instigators of the price manipulation, government authorities tolerate it as it supports the dollar’s value in the face of an enormous creation of new dollars and new federal debt. The U.S. government resorts to massive illegality across the board in order to protect its failed policies. The rule of law and accountable government have been sacrificed to failed policies. Later this week, efforts will be made to shore up the tentative "ceasefire" in Ukraine. Though officially nearly a couple of months old, the firing never ceased in eastern Ukraine, where the coup regime in Kiev, the one recognized and championed by Canada and its western allies, has continued its indiscriminate shelling of populated areas using weapons that include cluster munitions. Last week, the Harper regime in Ottawa pledged more than 20 million dollars worth of winter wear and other gear for Kiev - and even provided free delivery...free for the fascists that is. Roger Annis is a Vancouver-based peace and social justice activist and editor of the Canada Haiti Action Network website, CanadaHaitiAction.ca. Roger's writings can also be found at Rabble.ca, and at his site, A Socialist in Canada. Roger was recently in Crimea, from where he filed reports on the deteriorating living conditions for the people beneath the bombs of the Kiev coup regime, and now serves as a contributing editor to the new web site newcoldwar.org. And; having presumably finished its mission, KinderMorgan has backed off Burnaby Mountain for the time being. But not before sparking a showdown that saw more than a hundred "caretakers" arrested for defying a court injunction. Nina Jankovic was one of those; arrested with the Klabona Keepers. She's published an account of the mistreatment, courtesy of the RCMP, she and her fellows' suffered at Vancouver Coop Media's website. Nina Jankovic taking pipeline resistance to the mountain in the second segment. First Nations activist Jacinda Mack is speaking tonight at 7pm in Camosun College's Young building. The Xat’sull First Nation's Natural Resource Manager and Mining Response Coordinator of the Northern Shuswap Tribal Council has come down to the capital to keep the spill on the government's agenda, and on the public radar. Let me explain: The Obama administration is trying to rebalance US policy in a way that shifts the focus of attention from the Middle East to Asia, which is expected to be the fastest growing region in the coming century. This policy-change is called the “pivot” to Asia. In order to benefit from Asia’s surge of growth, the US plans to beef up its presence on the continent, expand its military bases, strengthen bilateral alliances and trade agreements, and assume the role of regional security kingpin.